CR-076. The art of Samuel Feinberg, vol.2. Beethoven - Classical records - compact discs with classical music, CDs online shop. 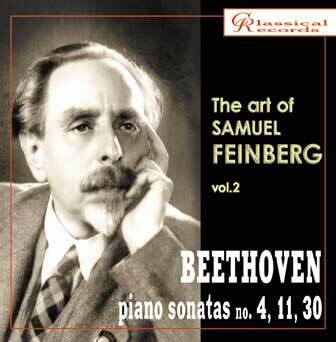 Samuel Feinberg was one of the most important and refined musicians of the 20th century. A great pianist, an outstanding composer, a unique pedagogue and a musicologist, he became one of the legendary figures in the history of the Russian music culture. Samuel Feinberg was born in 1890 in Odessa. Since 1894, his family lived in Moscow. His outstanding musical talent was recognized rather early. He studied music with Alexander Jensen and later with Professor Alexander Goldenweiser, meeting with whom became the turning point in Feinberg's artistic destiny. A wonderful pedagogue and outstanding pianist, he disclosed to the young pupil the secrets of virtuosity and deep understanding of classical music. At the same time, Feinberg studied composition with Nikolai Zhiliaev (his first opuses were written when the young composer was only 11 and already attracted attention of experts). In 1911, Samuel Feinberg graduated from the Moscow Conservatory. For his final exam, he prepared a program that included all 48 preludes and fugues from Bach's "Well-Tempered Clavier". Even for the Moscow Conservatory, it was sensational. After the declaration of the First World War, Feinberg was called to the army, but discharged after falling sick with typhoid fever in 1915. In that same year he gave a cycle of concerts and continued composing. His sonatas, romances, and concertos for piano and orchestra became famous in Russia and abroad. In 1922 Samuel Feinberg became a professor at the Moscow Conservatory. In the course of many years he created his own piano school marked by a special virtuosity, and developed a whole galaxy of fine musicians: Victor Merzhanov, Nina Yemelyanova, Vladimir Natanson, Ludmila Roschina, Zinaida Ignatieva, Victor Bunin and many others. In the class at in the Moscow Conservatory where Samuel Yevgenyevich taught hangs a memorial plaque in his honor. "Feinberg's brilliant dexterity and very strong musicality created an impression of something unprecedented and fresh for a German public used to less complex and expressive pianism." The phenomenal musical memory of Feinberg became proverbial. He knew by heart and could play by the request of his audience any piano composition by Bach, Beethoven, Chopin, Schumann, and Scriabin. Samuel Feinberg authored several unique theoretical works: the book The Fate of the Musical Form, and the monograph Pianism as an Art, which has become reference books for many musicians. Samuel Feinberg died in 1962. Do you have any questions about CR-076. The art of Samuel Feinberg, vol.2. Beethoven?